Last week I had the chance to experience mountain biking for the first time, and I have to tell you I absolutely loved it. I found it next to impossible to get bored, mainly because my attention had to be focused at all times to avoid hitting a tree or rock. Or swallowing bugs. Which I did, anyway. The place where we went is called Hardwood Hills and consists of a series of trails through the woods (on the mountains! Whodda thunk that one does mountain biking in the mountains. I know, right?!) The scenery was beautiful, the air fresh and the song of the birds very comforting. The first and second trails were very enjoyable and went by with a few minor challenges, some tricky parts where I had to go back and try again. I was ecstatic and had worked up an appetite, so we made a stop at the lodge to eat our lunch. I’m not sure if it was the amount of food, the heat and humidity, the excess adrenaline or a combination of all these factors, but by the time we headed out for the third and most complex trail of the day I was feeling very tired. 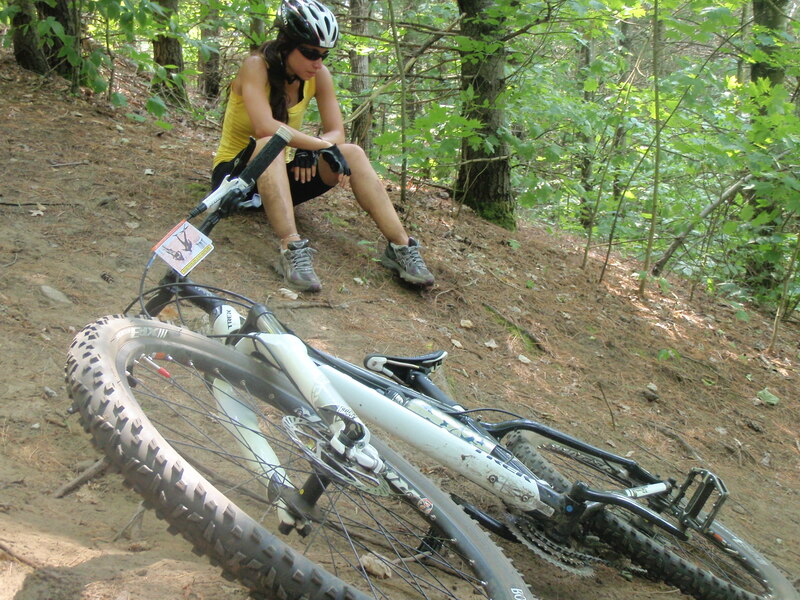 It occurred to me that this trail was proving to be extremely difficult: a lot of steep inclines, very high logs to be jumped, deep ditches in the middle of fast downhill rides– it all suddenly became too much, too hard, too fast, too scary. Overwhelmed, I panicked. What happened next was what I can best describe as a battle in my head. On one hand the tidal wave of fears and emotions that were taking over with thoughts of danger and regret running a million miles per second, and on the other my voice of sanity and reason telling me that this was all in my head, that obstacles are only as hard as I make them be. I proved the veracity of these words when I noted myself freaking out at even the frailest of branches on my path; I was now fully terrified and second-guessing my ability at even small obstacles similar to so many others I had successfully jumped throughout the day. But why? In one of so many steep climbs I lost control of the bike and fell. I rolled on to my back, looked up at sun shinning through the treetops, and cried. I cried out of frustration, but also in part out of despair. By now I felt certain this trail was never going to end, this ride from hell was never going to be over. Again, it was interesting to catch myself thinking in such an illogical way and finding it difficult to ground back into reality. I still have so much to learn, not only about mountain biking but about myself. I didn’t know the potential for such irrational fear could exist in me, and now my next challenge is to figure out its purpose. And if I find it to have no value in my life I must try my best to put it aside, leave it behind, let it go. It’s so much easier to climb hills and jump obstacles without carrying the heavy burden of mental luggage. A time or two I fell into the ways of a common saying, expressing I have a love-hate relationship with the bicycle. As logic dictates, this expression is erroneous and nothing but an illusion, because regardless of my affirmations the bike has remained neutral and I’m pretty sure it has never loved nor hated me. Of course in our logic we know this, and yet we still manage to state what is not. Habit? Excuse? Self-sabotage? And, why? I bring this up because this specific workout session on the bike taught me lots. Aware of many limits that needed to be broken I hopped on the machine and pedaled, focusing only on my breathing. The first indication that things were changing for the better came when Amaru (my trainer and boss) asked if I had been doing something during my three-week holiday, because I was performing much better than I had before. No, I hadn’t worked on my cardio for over three weeks; the only difference was that this time I wanted my cycling session to be better. As I kept going and many minutes passed the first recognizable signs of tiredness appeared: my legs felt heavy and my breathing was coming out of synch. Soon after I focused on these signs it was like my mental auto-pilot kicked in and immediately jumped into old ways. “I can’t!” I said. As soon as the words came out of my mouth my awareness came back, allowing me to learn a valuable lesson. I noticed how instantly after saying the words my legs felt many times heavier, each pedal a difficult task. I could sense my body slouching by the second, pain on my shoulders. The heat coming from my face was so intense it reminded me of the sensation previous to passing out. I felt like I was shrinking into a puddle of sweat that would quickly dissolve entirely. I gave myself a moment to observe what I had done, not mad or reprimanding, simply knowing. I corrected myself out loud “Yes I can.” and my eyes fixed on a spot on the wall as my conscious effort to overcome mental barriers began. And I did. For a total of 32 kilometers, which is much much more than I had ever done before.